What are Carpet Runners? Carpet runners or runner rugs are long, slim rugs that are usually rectangular in shape. Commonly used for narrow spaces like stairs, hallways and entryways, carpet runners may also be used as furnishings for any area of the house such as kitchens, bathrooms, bedrooms and other challenging spaces such as the bedside, foyer, dressing areas walk in closets, laundry rooms, pantries and home offices. Unlike carpets, which usually serve as a focal point of a room, a runner usually functions as a complementing decor or accent to a space. But aside from the stunning visual appeal and additional aesthetics that they contribute to a space, they are also popular for the practical function and benefits that they serve. Read on as we help you explore the beauty of carpet runners for your home. 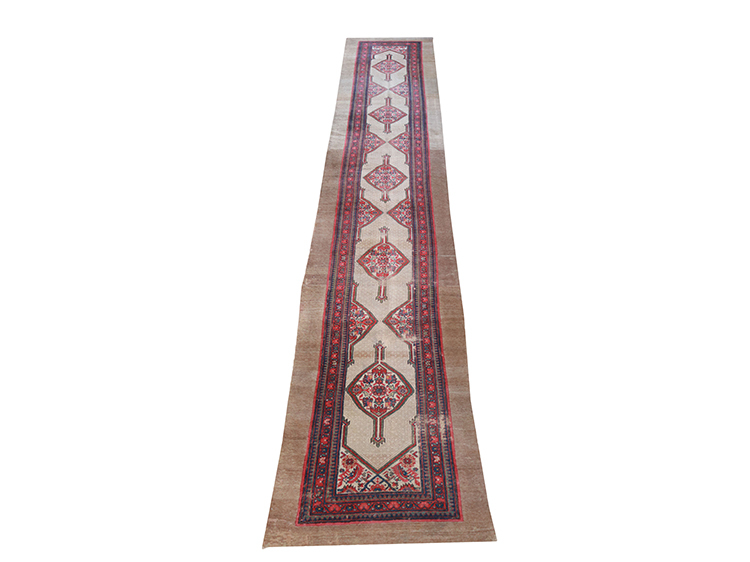 Bring an exotic touch of decor to your home with this Iran Tribal carpet runner. Handmade to perfection using a hand knotted technique, this work of art makes use of an eclectic blend of colors and a unique mix of ethnic motifs that will surely make any space radiate with a warm and welcoming feel. 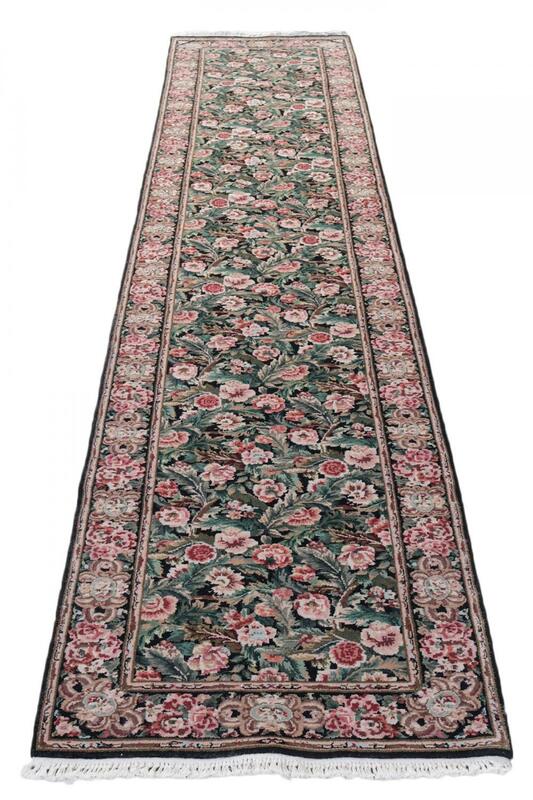 This type of carpet runner is perfect for galley kitchens as its size can fit long, narrow spaces. 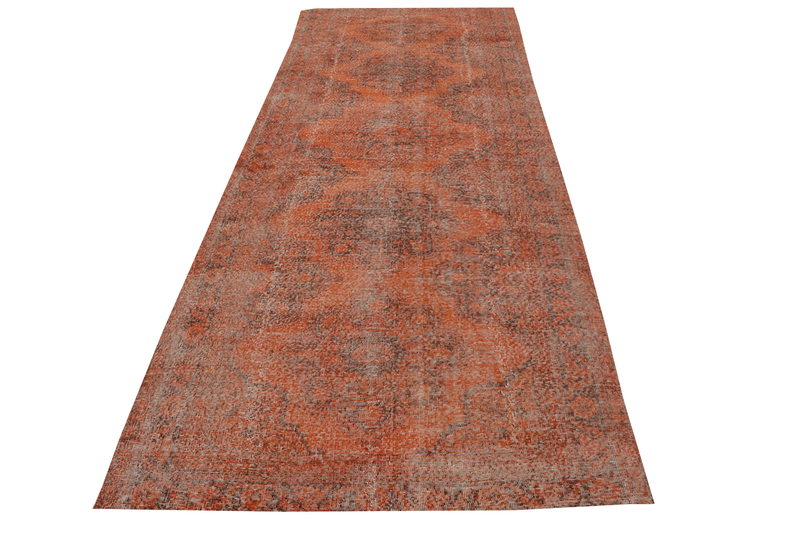 Also, this type of carpet runner is the ideal decor if you want to bring a twist on modern inspired homes. Gives added visual interest to a space. Like most carpet types, a runner rug can increase the visual appeal of a space significantly by bringing an element of color, texture and pattern. It can also change the mood and ambience that a room evokes by projecting warmth or a cool and calming atmosphere. It is also one of the easiest and quickest design fixes that one can use to spruce up areas in the home - dull stairs can easily be turned into a main attraction for the home if used with the right type of carpet runner. Hallways and entry ways which generally look too drab but the help of a carpet runner, they become more warm and welcoming. Reduces wear and tear. Carpet runners can serve as a protective feature for areas in the home which are most exposed to high traffic. Stairs, being one of the most used parts of the house are constantly subjected to wear and tear, making them prone to damage, scratches and fading. A runner carpet can also conceal damaged stair treads and unsightly marks, while at the same time, extending the life of the flooring material. Prevents slip hazards. Flooring materials such as hardwood and ceramic tiles have the tendency to be slippery and can sometimes present a risk for accidents. To prevent slip hazards, a carpet runner may be added to a stair as they act like a safety feature. This is especially helpful to households with children, mobility impaired family members and pets. Delineate areas within a larger room. Carpet runners may be used to define different spaces within a large room without having the need for partitions or a change in flooring material. It can break the expanse of wide hardwood floors and broad tile flooring. For example, if you want to add a small home office to your master suite, the addition of a runner rug can instantly anchor a desk and office chair setting. Noise Insulator. Walking on hardwood floors can sometimes create an unpleasant sound. Going up and down the stairs can also create a noise that can be quite intolerable. However, with the help of a carpet runner, these are reduced as it provides a soft surface which absorbs the sound. Provides cushioning and keeps the floor warm to the touch. A carpet, no matter what the type may be, always feel great under your feet. What could even be better, than waking up in the morning and stepping into something warm and cozy in your bedside? Carpet runners make hardwood floors, natural stone and ceramic tile flooring more comfortable to walk on. They make cold floors warmer to the touch. Make entry ways and foyers more welcoming and inviting with this one of a kind hand knotted runner rug from Northwest Persia, Sarab. Guaranteed to give your home a touch of timeless appeal, this runner rug can fit in other challenging spaces too, like hallways and stairs. Although the design is inspired by ethnic motifs and tribal details, this runner rug can also harmoniously blend with contemporary and modern interiors by rendering an artistic vibe and an eye catching presence to a space. When choosing a carpet runner for your home, choose based on four factors - the location where the runner is to be placed, the prevailing style of the home, the purpose of the runner and the amount of foot traffic the area receives. If the area is subjected to high foot traffic, make sure to use a carpet runner that is made up of a resilient material so it can withstand heavy and constant use. Some examples of heavy duty fibers for carpet runners are cotton, nylon, sisal and wool. Other materials such as jute, sea grass and silk are more recommended for low traffic areas. Also, dark colored carpet runners can easily conceal stains and soiling compared to light colored ones. Choosing the right style of carpet runner for your stairs is again, a matter of personal preference. They come with a variety of styles ranging from the traditional to the more contemporary designs, from subtle to rich color combinations and simple to intricate patterns. Although typically, the design of the runner is chosen according to the prevailing style of the home, you can try mixing and matching different inspirations to produce a unique fusion of styles. Make sure that it complements the colors and the interior decor of the home. Choosing the right pattern, on the other hand, is quite tricky, because some carpet runner patterns look better when laid on flat surfaces - such as a hallway. Some patterns do not look well when bent and folded on stairs. Large geometric shapes such as squares or diamonds in a repetitive pattern may be quite hard to achieve because it has to be aligned precisely. Sometimes, even the slightest mismatch can be noticeable, so make sure to hire a professional to install the carpet runner for you. Abstracts and floral designs which are commonly used in oriental and traditional rugs are more advisable to be used on stairs because they do not require matching. In addition to that, smaller patterns are also more ideal as they can be easily showcased in each tread and would look even when bent on the risers. Aside from the stairs, there are also other ways to apply a carpet runner to a space. It can be used alone, or as a complementary decor to other furnishings in an interior. One of the most trending applications of carpet runners is to layer them with another type of carpet. Using multiple rugs and carpets in a space can bring an interesting and unexpected twist in decor by bringing more variety in the shapes and patterns. Layering of carpets and rugs also make rooms more artistic. 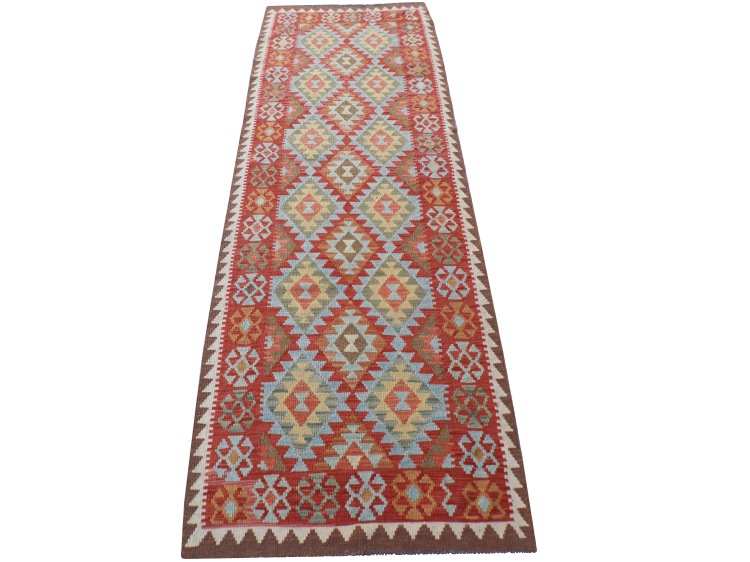 If you want to give your contemporary home office a quick makeover, try using this geometric patterned Kilim runner rug. 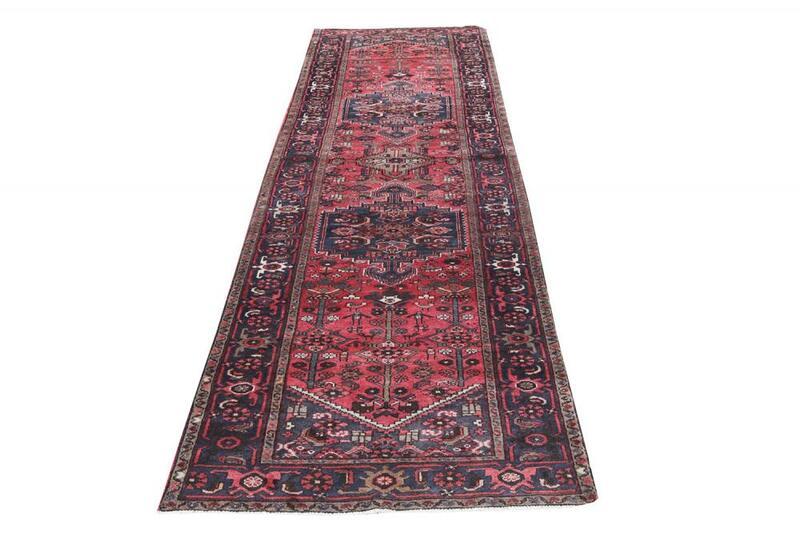 Hand made using natural wool fibers and colored using vegetable dyes, traditional rug is truly one of a kind. The interesting mix of warm and cool hues makes it versatile in matching with different color schemes, while its bright and lively pattern can work well with both traditional and contemporary interiors. A carpet runner is one of the quickest and easiest fix to spruce up a stairway. However, another common application of a carpet runner is to serve as a coverage and protection for the stair flooring material. When used for stairways, carpet runners are installed in such a way that they do not cover the whole width of the stair treads. The only general rule that one has to follow in installing carpet runners for stairways is to choose one that fits your stairs perfectly well. With such, critical measurement is needed. For installation, it is advisable that a border is placed on both sides of the carpet runner. Aesthetically, it is never placed wall to wall, with a portion of the floor visible on each side. The amount of space can vary, depending on your personal preference, just as long as both sides are equal. Also, carpet runners do not come in a standard size. Its length and width varies in the same way that each of its pattern and design is completely unique. When choosing the perfect size of carpet runner for your stairs, it is recommended that the runner has a one to five ratio - meaning the length of the carpet runner must be at least five times greater than its width. 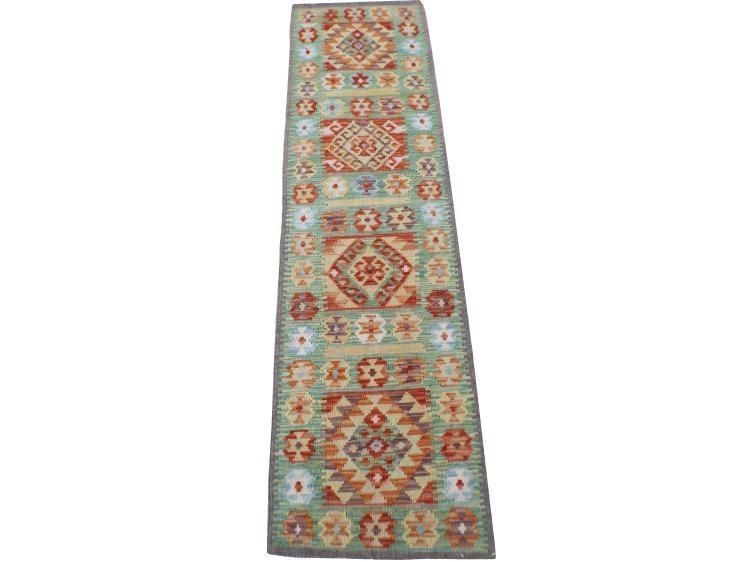 This beautiful runner rug is the perfect complement to a traditional inspired home interior. Contributing a classic flair with its exquisite European design of ornate floral and leaves details rich combination of red, green, pink and beige colors. This rug is the perfect decor for hallways and stairs in Victorian themed houses as it complements dark hardwood floors, luxurious wallpapers and charming upholstered wing chairs. Consider measuring your stairs accurately before purchasing a carpet runner. Take note of the required borders along the sides before purchasing. It is also important that the runner stays in place so make sure to add a non-slip rug pad under the specific carpet of your choice. Some runner carpets already come with a non-skid backing, however you can always add a rug pad for those without one. Rug pads are necessary especially for runners which are exposed to high traffic areas. It can significantly extend the life of your carpet by preventing it from getting worn out from top to bottom. Also, a rug pad provides insulation and works as an additional cushioning material. In terms of choosing the right rug pad size, make sure that it is slightly narrower than your carpet runner. For stairs, the advisable rug pad thickness is ¼ inches. Although installation can be undertaken as a “do it yourself” project, it is still best to leave it to the hands of a professional carpet installer for the best quality of work. Boasting of a unique weathered look, this traditional Turkish carpet runner is made from wool fibers and a distressed pile. Over dyed in a combination of rust and orange colors, the warm tones of this attractive vintage runner can bring an accent to a neutral color palette. Perfect to be used not only in hallways, but also in bedsides, matched with a cool beige color scheme and some rust accent pillows. Bring home a masterpiece of global origins from our unique collection of antique Persians, modern and vintage Kilim carpet runners here at The Rug Warehouse.